With the warmer months coming soon, or for some of us, already here, salad making can be a valuable asset. Why? because when it's warm, most of us would rather be doing something other than cooking like relaxing in the sun, visiting with family and friends, or gardening. Pasta salads can be made ahead and when served with grilled meat, dinnertime can be hassle free which will allow for more sleeping in the sun or doing what YOU want to do. I happen to be very fond of pasta salads not only because they taste good, but because they are so versatile. They can also be a complete meal by themselves. But even though they can be a complete meal, I usually serve them with grilled meats. Here are some ideas for making pasta salads. Pasta: your choice; macaroni, spaghetti, bow ties, spiral, or whatever you want; prepare according to package directions. Dressing: your choice of purchased salad dressing, homemade dressing, or a dry mix. Tip: if you want low-cal, use a dry mix with nonfat sour cream, plain yogurt and/or reduced fat mayonnaise. Vegetables: your choice of chopped vegetables; peppers, mushrooms, tomatoes, snap peas, celery, onion, cucumber, zucchini or whatever you have on hand. Sometimes the vegetables (green beans and carrots are examples) taste better if you cook them for a minute or two in boiling water. Meat (optional): pepperoni, chopped roast beef, chopped bologna, tuna, salmon, bacon, leftover meat or any meat you may have on hand. Cheese (optional): cubed or shredded mozzarella, cheddar, Monterey jack, colby or whatever you have on hand. Other (optional): chopped dill or sweet pickles, chopped fresh herbs, or chopped olives. By using this method, you get a different salad every time you make one! My favorite pasta salad is spaghetti salad. My mom first served this at a Fourth of July gathering and we have been hooked on it since. All you do is cook spaghetti noodles, drain, run them under cold water to cool them down and drain again. Add the drained noodles to a bowl, add purchased Italian Salad dressing (to taste), your choice of chopped vegetables and, if you want, chopped meat. Chill. Be sure to make pasta salads ahead of time and refrigerate them to let the flavors blend and to save preparation work at dinnertime. If for some reason you don't get to make it ahead of time, don't worry about it, the salad will still taste good. 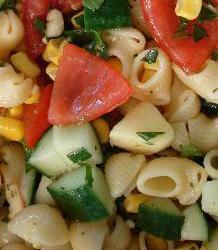 You can garnish your pasta salads with fresh herbs, or, if you don't have any fresh, sprinkle some dried herb on top. I hope you'll be making more pasta salads than ever this summer so you can spend more of your time enjoying the summer the way you want. Feel free to publish this article as long as the above bylines & this note are included; notification at _Plantldy98@aol.com_ (mailto:Plantldy98@aol.com) would be appreciated.